As a sweeping generalisation, I’d say that the majority of divers are overweighted. Being overweighted affects your body position in the water, it increases drag, effort required to get around, air consumption, and the number of adjustments required to your BCD. So why do it? A key factor is that without being overweighted, many divers struggle to get down at the start of their dive. So how is a controlled descent performed? Take note of the following simple tips and tricks and you’ll be descending like a pro in no time. Breath out S L O W L Y and fully, and you should sink slowly, not like a brick to the bottom! The key to sinking is to keep your arms and legs completely still, do not kick or skull. You may wish to add a small amount of extra weight (1.5kg) following your buoyancy check. This compensates for the fact that your tank starts to become more positively buoyant towards the end of your dive as you have breathed the air from it (which has a weight to it). Otherwise, you may find you are a little light on your safety stop, and struggle to stay at the 5m mark. So how do you descend in a controlled manner? S = Signal to your Buddy “ok” and thumb down for going down. O = Orientate yourself, have a look where you are going. Ideally you should use either a descent line or a visual reference to assist. R = Put you regulator in. You would be amazed how many people try and descend with their snorkels in! T = Time. Check your watch as this is the start of your dive time, check your computer is in dive mode. E = Elevate your low pressure inflator hose (if you have one) and check you can equalise your ears. D = Dump ALL the air from your jacket and descend. It is important that the BCD is fully deflated to descend. If you are correctly weighted, you are not going to have an uncontrolled descent or risk any potential equalisation problems due to a rapid descent. Performing the above actions prior to your descent will settle you into the dive and help you to relax. It is important that you exhale slowly to allow you to descend. A slow trickle of bubbles should be noticeable. Humming to yourself is also a good trick to ensure you breathe out slowly. The first few metres can be tricky to descend. Until the increased pressure associated with increased depth compresses your wetsuit, the descent will be slow. Be patient! Continue to take long slow breaths out and until the increased pressure has reduced your buoyancy (generally the first 5 metres). Refrain from taking any large breaths in which may result in floating you back to the surface. 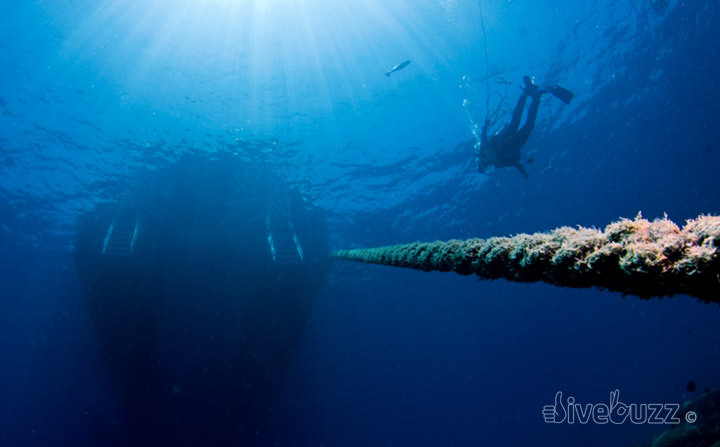 Often, excitement, apprehension or anxiety at the start of the dive can affect breathing rate. Following the SORTED technique will of course help to settle you down, however, focus on slow, relaxed and steady breathing. It may help to count your breaths in and out in your head – in, one, two, out, one, two, three, four, five, six… and so on. Equally as important, stay still and relaxed. You will never get down if you are kicking or skulling so focus on keep your arms and legs still and relaxed. A known technique on descent known as the “bubble check” is often performed by Technical divers. This is a worthwhile check for any diver. The idea being that you should pause your descent at around 5m. Treat this pause as an opportunity to check in with your buddy and ask if they are ok. You may also want to check that your computer has activated, your gear is in place and you are streamlined – alternate air sources have a habit of breaking free from your quick release clips on entry. I recommend that whenever possible, use a line to descend on. Either a shot line, weighted flag, mooring line or anchor chain will do. Note, however, that in less than perfect conditions, anchor chains can be dangerous places to get close to, so assess the conditions beforehand. Using a line helps keep you stay correctly oriented on your descent by acting as a visual reference. The added bonus is that, if all of the above fails, you can use the line to pull you down those first few metres! You may want to descend feet first, to help keep you oriented on the descent. I’d generally recommend less experienced divers to always descend feet first for the first few meters at least. A vertical position is essential for dumping all the air out of your BCD using your Low Pressure Inflator. Alternatively, you can descend horizontally in a free-fall sky diving position (after the initial few metres), or even head first. For some reason, some divers may find equalising more difficult if descending head first though. As you descend, your wetsuit compresses further, as does any padding or remaining air pockets in your BCD. You will, as a result, become more negatively buoyant as you descend. It is vital that you retain your buoyancy on your descent rather than allow yourself to start to rocket to the bottom. To do this, you may need to add small bursts of air into your BCD as required. By doing this, you will be able to ensure that you can ascend slightly at any point, pending any equalisation issues. So that’s how to descend easily and safely in a nutshell. Descending correctly puts you in the right frame of mind for the rest of your dive. So, what are you waiting for? Go down and get wet! Thank you for kind info.